I’ve been hesitant to talk about it because I was waiting until it’s smogged and in my name. 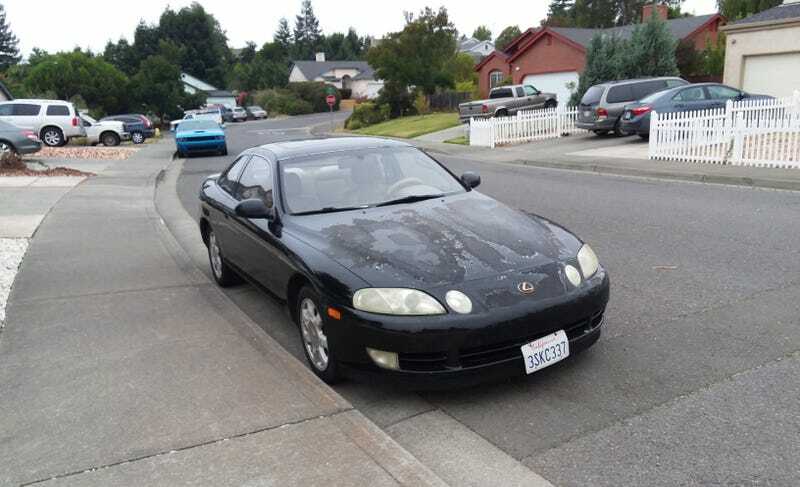 But alas, thats taking a while and oppos slow lately so heres a rundown of a $1350 sc400's issues. I had about 250 miles of driving to get it home, with a mix of San Francisco 8pm Traffic and 150 miles of clear highway. Important issues: It has an occational misfire so before I can attempt a smog I’ve got to do a tuneup which will consist of plugs and plug wire. Also The surge tank had a leak, thermostat housing was leaking, the coolant was wrong, pcv gasket was leaky, and the thermostat was an AutoZone part not an original. Less important issues: Front tires have dry rot, driver side door panel is broken(The quintessential SC problem), rear seat is torn from sun damage, a.c. dosent work, Aftermarket alarm that goes off if you close the door too hard, chipping body filler, quarter panel damage, peeling paint, driverside pwr window is on its last legs, needs a valve adjustment(which isnt easy because it requires shims and timing belt/ cam removal), Lca bushings are on the way out(another common issue), bad tie rods, blown front shocks, drilled rotors, blinker dosent make noise anymore, and the front clip alignment is a little borked. The good: I won’t feel bad about modifying an already beaten chassis, The rest of the interiors in acceptable shape, new waterpump, 12 disc cd changer works, Nakamichi stereo all works with excellent sound, sunroof(common but still good), all the engine bay cladding is still there, most of the car is neglected but not broken(for example the headlights are fogged over but not cracked), And.....IT STILL HAS IT’S OEM FRONT LIP. The plan is swap the front suspension from the dead SC, fix all the motor issues, and attempt a smog At the least reputable shop I can find. Depending on how it fails I will buy 2 civic catalytic converters and have them welded up behind the light off cats(His Stigness throws computer across the room). It has out of state emissions setup so it may fail the sniffer because Ca got an extra cat, or the inspection because it’s not ca egr(but clearly it has passed before). Then there’s the back registration because the tags were up in June, and the fact that the owner only signed the pink slip release once(and there are 3 spots). These are all mere details. Ill have more to say once the stressful part of getting it in my name is over.